Are you looking for phenomenal self esteem books for kids to add to your collection at home or at school? Then this list of self confidence books, stories about self love and all the reasons to rock what we’ve got is the list for you! Self esteem. Sometimes it seems like children have it or they don’t. But this is far from the truth. In actuality, confidence can be learned and even mastered! As a librarian at an elementary school and the mother of two young boys, I see kids struggle with confidence on a regular basis. From “I can’t do it” to “I’m not good enough,” it is heart breaking to watch children — all of whom possess so much potential and so much goodness — talk themselves out of something because they fear they won’t measure up. Books to the rescue! Self esteem books for kids are such a wonderful way to help nurture confidence, providing the perfect tools to spark conversations about your children’s important talents and unique characteristics. And growing confidence, be it your child’s or your student’s (or even your own! ), is a critically important skill that will allow kids to take risks, try new things, and understand that flops and defeats are crucial to healthy social-emotional development. After all, mistakes help us learn, thrive and resolve to try again! From finding the courage to stand up to others, to learning to believe in ourselves and our unique abilities, the characters in the stories below all learn a thing or two about self worth. So sit back, grab a stack of these stories (some of Happily Ever Elephants’ favorite children’s books!) and encourage your kids to start believing in their beautiful selves. Hope these self esteem books for kids get two trunks up in your homes and classrooms, too! Self Esteem Books for Kids We Absolutely Adore! Remarkably You, by Pat Zeitlow Miller and illustrated by Patrice Barton: Looking for an ode to children that details all of the ways in which each of us is remarkable? If your answer was yes, this is the book for you! In rhyming, pitch perfect verses, it conveys to kids that each of us walks to the beat of our own drum - we are all wondrous, we each have special talents and we are all so perfectly unique! This is a beautiful reminder that these unique attributes are ones to celebrate, and no matter who we are or what we do, each of us has the ability to make a difference in our world! For our full review of Remarkably You, CLICK HERE! Dear Girl, by Amy Krouse Rosenthal and Paris Rosenthal and illustrated by Holly Hatam: Oh, what a beautiful love letter this is for all of you with special girls in your life, by far one of the best self esteem books for kids that is out there today! Whether your kids are toddlers or teens or somewhere in between, this lovely book conveys that girls are strong and valued. Most importantly, it reminds girls to love themselves, know their worth and always trust their gut instincts. We cannot wait for Dear Boy, to publish soon!! Giraffe Problems, by Jory John and illustrated by Lane Smith: If you are looking for a funny self esteem book for kids that celebrates self acceptance and our distinguishing, unique characteristics, look no further! Giraffe is miserably self conscious about something- if you guessed his neck, you are right! It is so long, and no other animal has a neck like his. He’s tried hiding it and disguising it, but it’s no use. Luckily, another animal comes along to help him realize all the awesome things he can do with a long neck— and how unbelievably great he looks in a bow tie. This one is so much fun! I Am Enough, by Grace Byers and Keturah A. Bobo: This is a stunning poem, a lyrical ode to loving exactly who you are! It’s one of those beautiful picture books you can’t put down without feeling an instant sense of serenity, a feel good book that empowers all readers to love themselves- and all of their unique abilities and attributes- unconditionally. The OK Book, by Amy Krouse Rosenthal and illustrated by Tom Lichtenheld: We simply adore this clever book, a play on words, that shows kids and adults alike that it’s ok to simply be “OK.” OK is personified in numerous different ways in this story, depicting an ok climber, skipper and and right and left fielder. The story’s gentle but powerful message conveys to all readers that there being comfortable with being ok will help you discover excellence, so long as you keep playing and exploring! Red: A Crayon’s Story by Michael Hall: This is the most fabulous self esteem book for kids, as it reminds us to take a step back and really listen to who we are. It is the story of Red, a red crayon. Or is it? It seems the crayon is having an identity crisis, for though he is wrapped in a red label, there is no debating that every time he colors, he is not red but blue. One day, the frustrated crayon meets a new friend who tells Red what he really needs to hear: Red isn’t Red at all… he’s actually blue! And so it is that this was just what Red needed needed: a gentle nudge to be true to who he knew he was all along. For our full review of Red: A Crayon’s Story, click here! Spork, by Kyo Maclear and illustrated by Isabelle Arsenault: Spork is the product of two loving parents- one spoon, and one fork. But as a combination of the two, he sticks out in the cutlery drawer! He's either too round, or too pointy, and he can't figure out quite where he belongs. But then a baby arrives at the table, and it’s this small child who paves the way for Spork's self-actualization and acceptance, reminding us that no matter who we are or what we look like, we all have a place at the table. 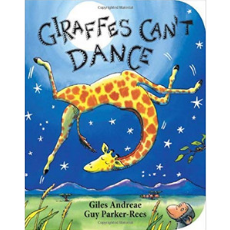 Giraffes Can’t Dance, by Giles Andrae and illustrated by Giy Parker-Rees: An oldie but goodie, and one we love for the way it reminds us all to embrace each and every one of our attributes- even the most, shall we say, ungraceful! Even if you are different, even if you aren’t the best at every skill you undertake, this sweet story reminds us that we are still so very special— and so very great. All the Ways to be Smart, by Davina Bell and illustrated by Allison Colpoys: A diverse group of children celebrate the ways in which they are just that — smart. From readers to builders, creators to healers, this book showcases all of the various ways children display their own unique forms of intelligence. Intelligence manifests itself so differently in all of our little ones, and each kid’s smarts — whether in the form of creativity, ingenuity, or sensitivity — should not just be recognized, but honored, celebrated, and applauded, too! For our full review of All the Ways to be Smart, click here! Zero, by Kathryn Otoshi: When Zero looks at herself, she sees a big round circle with a hole in the middle. She feels valueless, unlike the other numbers, and she just wants to be counted. Though she pushes and pulls herself to try to become like the other numbers, she quickly realizes she can only be Zero— and one day, when standing together with a group of other numbers, Zero realizes just how much value she really has inside. From the author of One, this is another gem! I’m Gonna Like Me: Letting Off a Little Self Esteem, by Jamie Lee Curtis and illustrated by Laura Cornell: This is such a fun self esteem book for kids that places them smack in the middle of every-day situations — even challenges. It reassures little ones that they are always valued and missteps they make are ok. The illustrations are vibrant, zany and possess so many fabulous details that kids will love poring over as they remind themselves that there is no better thing to celebrate than themselves! Amazing Grace, by Mary Hoffman: This fabulous story sparks the conversation that each and every one of us can achieve our big dreams, despite the jeers of other kids and naysayers. Grace has a flair for dramatics, and when her teacher announces a class production of Peter Pan, she wants to be the lead. Until, that is, another child in her class tells her she can’t play the lead because of her black skin. Dejected, Grace tells her mother and grandmother what happened and is met with their reminders that we can be anything we want to be if we simply put our minds to it. A treasure! Chrysanthemum, by Kevin Henkes: Little Chrysanthemum loves her name— until she begins school and gets made fun of by the other kids because it is so unusual. Chrysanthemum has trouble accepting her uniqueness, until she meets someone else with a similarly unique name who helps her realize that there is beauty in being different from the crowd. This is a wonderful book to discuss bullying and self acceptance! Beautiful, by Stacy McAnulty and illustrated by Joanne Lew-Vriethoff: This is an ode to the tree climbing, science loving, dirt slinging, sports playing, creativity seeking girls who regularly defy expectations and gender norms. Though the text describes perfect girls who move gracefully, understand makeup and have a smart style, the pictures tell a much more subversive, contradictory story. There is no better story to show your STEM loving, gender-defying girls that they are at their most beautiful when they run from societal limitations, conquer challenges, and play with a mind towards personal empowerment. For our full review of Beautiful, CLICK HERE! Tough Guys Have Feelings Too, by Keith Negley: For those of you with boys at home, I simply adore the way this book spins the narrative and empowers boys to share their emotions. This book reminds boys, many of whom are conditioned to be “tough,” that even the most many and heroic men have big emotions, and it’s ok for the world to see them. This book is a great one to spark conversation about feelings, and the way that boys should honor, embrace and even celebrate the myriad of emotions they experience. Real men DO cry, and young boys will feel confident in themselves when they understand that they don’t have to hide behind a mask of steel. Love this one! 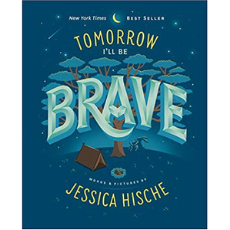 Tomorrow I’ll be Brave, by Jessica Hische: What a stunning book! In this gorgeously illustrated poem, children are reminded that even if today wasn’t their day, tomorrow is a new one, another opportunity to shine! This lovely book is so uplifting, filled with wisdom on every page. Celebrating curiosity, bravery, confidence, strength, and more, this is a tender and inspirational story reminding each of us that with every new day comes a new opportunity to strive for our dreams! 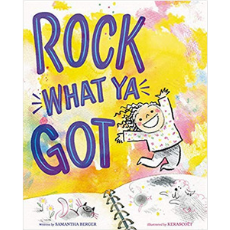 Rock What Ya got, by Samantha Berger and illustrated by Kerasocet: This is the story of an artist who picks up a piece of paper and draws a little girl. The girl has a face, a body, two arms and legs, and a mane of wild black hair. The artist sighs deeply though, because her girl is not quite right. Yet something surprising happens every time the artist attempts to erase her creation: her character, Viva, grabs hold of the artist’s pencil and tries to stop her. Why? Because Viva likes who she is, and she wants the artist to let her rock what she’s got. Through lively illustrations, snappy rhyme and a jubilant tone, Viva ensures that she will be celebrated, not erased. For our full review of Rock What Ya Got, CLICK HERE! 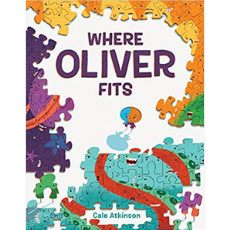 Where Oliver Fits, by Cale Atkinson: Oliver is a puzzle piece, and he always wonders where exactly he will fit in. He spends his days dreaming of the possibilities — the mane of a unicorn? An astronaut’s helmet? — and he constantly changes himself to try out different scenarios. Feeling like you don’t belong is pretty universal for young kids, and this wonderful self esteem book for kids shows that always trying to fit in is challenging. Yet, as is the case with any puzzle, a bit of trial and error helps Oliver figure out exactly where he belongs — at which time he discovers that being himself is the most fitting place of all. A Bad Case of Stripes, by David Shannon: Camilla Cream loves lima beans. But guess what? No one else in school agrees. Poor Camilla worries so much about what her classmates think of her, and it causes her to break out into a bad case of the stripes! Once Camilla is assured she is not contagious, she returns to school where her skin and her body continually take on new wacky forms and patterns as the other kids laugh and laugh. I love the way this book reminds children that not everyone will have the same likes and dislikes, and being true to yourself is what matters the most. Old Hat, by Emily Gravett: Harbet loves his old knit hat, but it’s not nearly as cool as the latest fashions that the other animals are wearing. So he keeps trying to get the newest, trendiest hats... but every time he gets the hat all the other animals were wearing, a newer, cooler head piece arrives on the scene. Whatever will he do? It is an awesome self esteem book for kids in that it imparts how much beauty can be found in individuality and there is so much joy to be had when we learn to value the characteristics that make us special (even those characteristics we seek to hide!) For our full review of Old Hat, CLICK HERE! 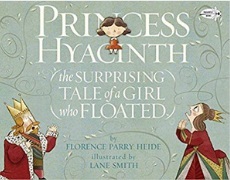 Princess Hyacinth, The Surprising Tale of a Girl Who Floated, by Florence Parry Heide, and illustrated by Lane Smith: Princess Hyacinth has a most unusual problem. Unless she is weighed down by her heaviest princess attire and jewels, she floats right up to the sky! This causes some anguish, obviously, as her clothes are uncomfortable and she longs to be able to play on the palace grounds like other children. One day, on a walk in all of her weighty gear, she comes across a balloon man outside, and that's when Princess Hyacinth comes up with an idea that might just be a game changer. Will she find her inner courage and learn to embrace her rather unique characteristic? For our full review of Princess Hyacinth, CLICK HERE! Mr. Tiger Goes Wild, by Peter Brown: Mr. Tiger is bored with his life because he is always made to act proper. So what does he do? He begins to bend the rules, little by little- first by walking on all fours, then by roaring loudly, and then by taking off his suit and jacket (which is guaranteed to get some glorious giggles out of your kids!) Mr. Tiger's family and friends are not thrilled with his behavior and tell him he would be better served in the wilderness, so off he goes. This fun and adorable story reminds our kids how important it is to remain true to themselves, to stand up for what they believe in, and, when necessary, to go against the grain. For our full review of Mr. Tiger Goes Wild, CLICK HERE! 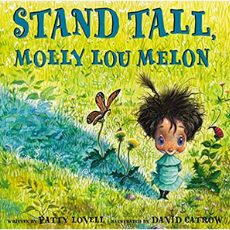 Stand Tall, Mary Lou Mellon, by Patty Lovell and illustrated by David Catrow: Molly Lou Melon is not your average hero - she’s a small, buck toothed girl with a voice “like a bullfrog being squeezed by a boa constrictor.” Yet, thanks to her grandmother, Molly’s got unbreakable self-esteem. But when she begins a new school, will Molly have enough confidence — and enough courage — to stand up to the school’s most horrible bully? Hooray for Mary Lou Mellon, the most unlikely hero your kids are sure to adore! Favorite Children’s Books About Love!